Summer squash is a tender annual. Plant outside after danger of frost is passed. Row covers will help if the temperatures drop too low. Blossoms are often used for salads or for being stuffed. All transplants are certified organic. Select here for transplant information, pick up and order dates. 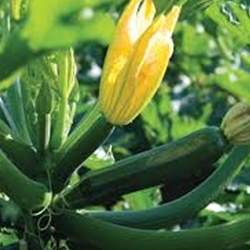 Dark green zucchini with excellent disease resistance and high yields. Resistant to powdery mildew. Fruits are straight and slightly ridged with an attractive glossy, dark green skin. Plants are compact, single stemmed and spineless.